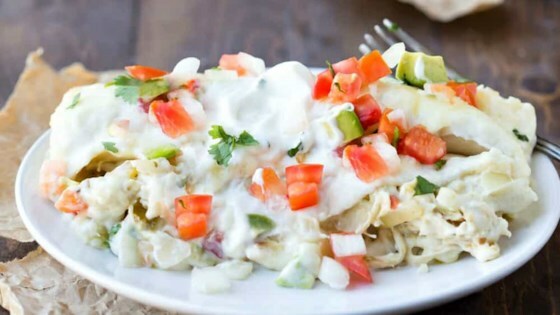 "You can make these creamy salsa verde chicken enchiladas in just 1 hour! Top with chopped cilantro, crumbled queso fresco, and any other desired toppings just before serving. Recipe created by I Heart Eating." Preheat oven to 350 degrees F (175 degrees C). Grease a 9x13-inch baking dish. Set aside. Heat vegetable oil in a large skillet over medium-low heat. Add onion and cook for 2 to 3 minutes. Stir in garlic and continue cooking for 30 seconds. Add chicken and salsa verde; stir to warm through. In a separate saucepan, melt butter. Whisk in flour and cook for 1 minute. Stir in chicken broth, Shamrock Farms Premium Sour Cream, half-and-half, and cream cheese. Continue stirring until cream cheese melts. Whisk in 1 1/2 cups shredded cheese until melted. Season with salt and pepper to taste. To assemble, spoon some of the chicken mixture down the center of each tortilla. Roll tortillas up and place seam-side down in prepared baking dish. Pour cheese sauce over the top. Sprinkle with remaining 1/2 cup shredded cheese. Cover with greased foil and bake for 15 minutes. Remove foil and continue baking for 15 to 20 minutes, or until hot and bubbly. Light and fluffy waffles made with Shamrock Farms Sour Cream. Substitute regular half-and-half for the fat-free if preferred. Use reduced-fat cream cheese if preferred.